AFV Club offers this brass ammo set to support its kits of the Bofors anti-aircraft gun and the M42 Duster series. and The set includes four each of the: TP-T (which I could not find in the WWII reference The American Arsenal, so they might be postwar); the high explosive HE-T; the armor-piercing AP-T; and M17 dummy round. All rounds compare well to the actual size of 17.62 inches. Also included are four empty casings. Each round and case needs to be superglued to its corresponding photo-etch base plate. The engraving on the plates is well done and readable with a magnifying glass. No decals are included in this set. 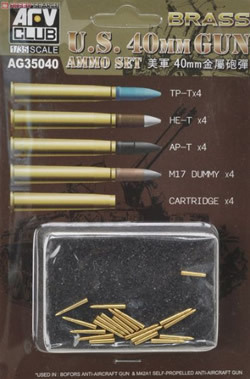 For use in a diorama, it's helpful that the TP-T, HE-T, and M17 dummy look very similar, so you can paint them to represent other types if you need to, though you won't have the decals to further identify them. While I bemoaned the lack of separate rounds in the otherwise excellent U.S. Bofors gun, AFV Club has provided the necessary accessory for your diorama or vignette.